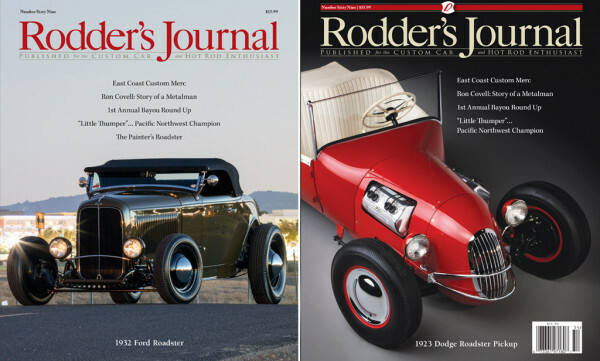 Produktinformationen "Rodder´s Journal Issue #69"
This 170-page issue is our largest in years, and it takes an in-depth look at everything from homebuilt traditional hot rods to the 1st Annual Bayou Round Up and the career of acclaimed metalman Ron Covell. The newsstand cover features the Ardun-powered Miller/Wusz ’23 Dodge roadster pickup from Portland, Oregon. Scott Perrott restored two iterations of the car, and we examine them both in this issue. Veteran hot rod and custom car painter Darryl Hollenbeck’s “Rotten Avocado Green” ’32 Ford roadster is the subject of the subscriber cover, which we shot in Concord, California. Also in TRJ #69, we have a father-and-son-built mild custom Mercury, a chopped, channeled and tire frying ’34 Ford pickup, and a whole lot more. Weiterführende Links zu "Rodder´s Journal Issue #69"
Kundenbewertungen für "Rodder´s Journal Issue #69"